This ballad begins: 'Before Apollo had a lute / More than a hundred year, / Macgregor played on his own pipes / His Highland clan to cheer.' A note below the title states that 'This Popular Reading can always be had at the Poet's Box'. 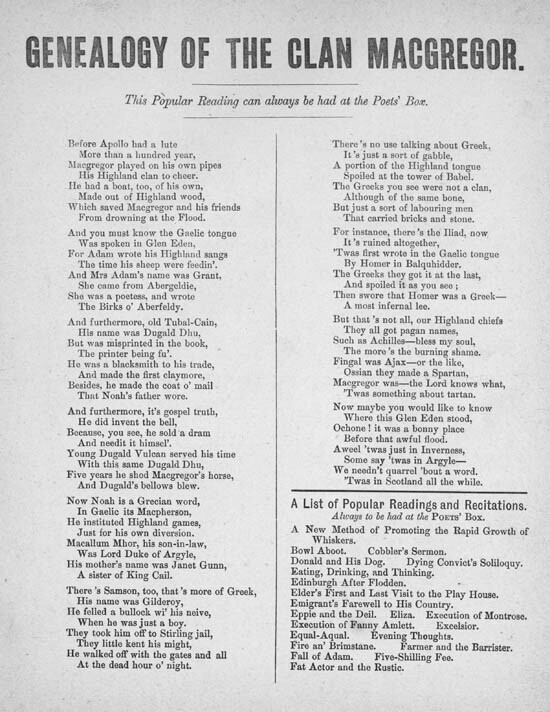 Unfortunately, it is not specified which particular Poet's Box in Scotland published this sheet and also no date of publication has been included. The list of other songs that are available for purchase from the Poet's Box makes for interesting reading, and reveals much about the type of content that was often included in broadsides. Written in a lofty and erudite manner, this light-hearted ballad celebrates the achievements of the MacGregor Clan. By comparing some legendary MacGregors to famous characters from literature such as Apollo, Ajax, Achilles and Samson, the writer draws attention to the musical and martial qualities possessed by members of the clan. Indeed, the ballad reads much like a eulogy. Interestingly, the writer also incorporates the Ossian stories into his tribute, and weaves together biblical tales, Celtic myths and classical myths into the one, overall pattern. The outlaw, Rob Roy MacGregor (1671-1734), was probably the most famous member of the MacGregor clan, and a famous statue of him can be found in Stirling.